I can't believe I didn't write this post sooner. I had every intention, and I actually thought I already did, but apparently not! Do you see that beautiful sandwich up there? That bread looks suspiciously gluten-like doesn't it? That's funny, because it tastes suspiciously gluten-like also, but it is NOT! I'm guessing most of you have either heard of it or tried it by now, since I put off this post for so long, but THIS is the ultimate gluten free bread. If you haven't already heard of them, then you MUST go check out Udi's Gluten Free Foods! 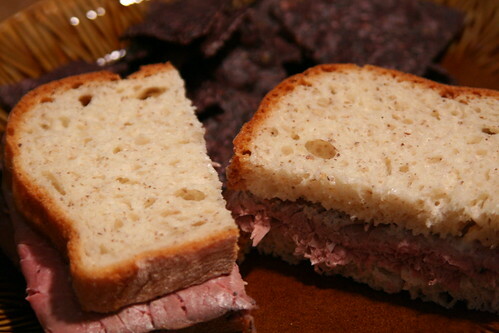 This particular sandwich is made on the whole grain bread but they also offer white sandwich bread as well. As you can see, this bread is not toasted. How insane is that? A store bought gluten free bread that doesn't need to be toasted? Well not only that, but get this - you can defrost the whole loaf and just leave it on the counter. Seriously!! I'm trying to keep processed foods of any sort to a minimum and even though this bread is gluten and dairy free (also soy and nut free) it's still processed. I usually just have it in the morning with my egg(s) and that works out great. I had been looking for a bread that I could just eat by itself as toast and this is the absolute perfect one. The taste and texture are exactly what I wanted. Udi's also offers many other gf/df products and I hope to try more of them very soon!! BIG fan of Udi's too. I actually just did a taste test of my own on their white bread, muffins and pizza. Stop by. Thanks for posting, sandwich looks so good! I just found Udi's too! I've been loving having toast and french toast for breakfast again and a good sandwich at lunch. :o) I got two loaves yesterday and am hoarding one in the freezer and am working on the first. Glad to know it's also in the northeast! I love Udi's gluten free bread. It is amazing. I feel like I can serve anyone a sandwich on it and not explain that it is gluten free. And you can get it from Fresh Direct--which is a huge plus. Thanks for your post. I need to do a post on this too. We agree. Udi's is the best gf bread. That is some beautiful bread. thanks for posting!!! I have been hearing a lot about this bread. I must find it! Thanks for this post on Udi's we tried the bagels and thought they were pretty good. Do you exactly where in Boston we can find the bread? We checked at the WFs on cambridge street, but no luck. Any comment response much appreciated! Hey there, although WF's is listed on the Udi's website as a vendor, I have also had trouble finding it locally. I did finally find it at the Hingham location. I have not been to the Cambridge street location in a long time. I would suggest asking the folks at WF's about it, they are great at making sure they stock what we want!! If you can get to it, Good Health in Quincy stocks it!